Machine is updated by software. When new software release, you can ask for the latest software from us. 2) Best quality with unlimited tokens. CK-200 comes with 10256 tokens inside. When token run over, you can use token charge program to add tokens for free. It is very easy to do. 3) Adds more function, like IMMO, meter, gasbag and so on. Attention: Please keep the setup language is English when you use this CK200. If you need other language. After you start the machine, switch the language, but do not save it. To make sure next time when you start the CK200, it is still English. 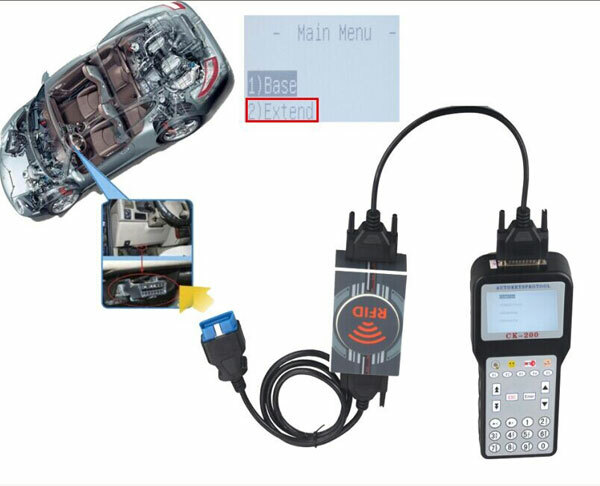 Free download: CK200 key programmer 38.03 version support car and function list. For extend expand cars, you need to connect this two to enter. This box has the same serial number as the CK-200 key programmer. This box only can be used on the CK-200 with the same serial number.